Mastering convolution integrals and sums comes through practice. Here are detailed analytical solutions to one convolution integral and two convolution sum problems, each followed by detailed numerical verifications, using PyLab from the IPython interactive shell (the QT version in particular). (a real exponential decay starting from t = 0). 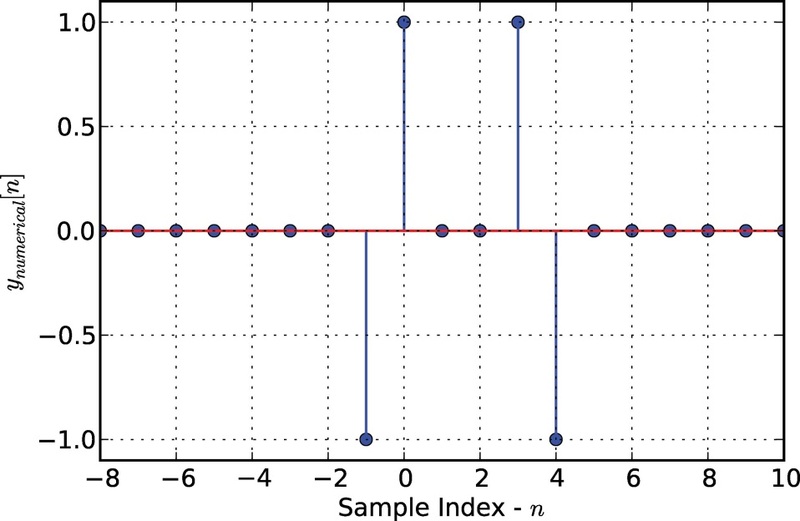 The figure provides a plot of the waveforms. 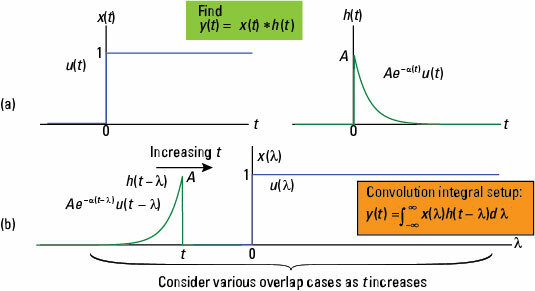 You need two cases (steps) to form the analytical solution valid over the entire time axis. Case 1: Using Figure b, you can clearly see that for t < 0, it follows that y(t) = 0. Notice that the fifth argument of the conv_integral function is (‘r’,’r’). For signals with infinite extent to the right, each ‘r’ tells the function that both signals are right-sided and to return only the valid support interval under this assumption. The default values of (‘f’,’f’) means finite support for both signals over the input time axes t1 and t2 given to the function. Once again, the agreement is excellent, so the analytical solution is verified. For the case of discrete-time convolution, here are two convolution sum examples. The first employs finite extent sequences (signals) and the second employs semi-infinite extent signals. You encounter both types of sequences in problem solving, but finite extent sequences are the usual starting point when you’re first working with the convolution sum. Consider the convolution sum of the two sequences x[n] and h[n], shown here, along with the convolution sum setup. 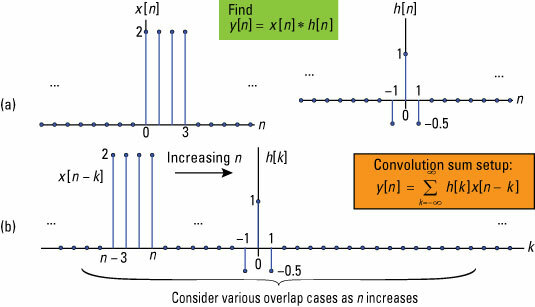 When convolving finite duration sequences, you can do the analytical solution almost by inspection or perhaps by using a table (even a spreadsheet) to organize the sequence values for each value of n, which produces a nonzero overlap between h[k] and x[n – k]. 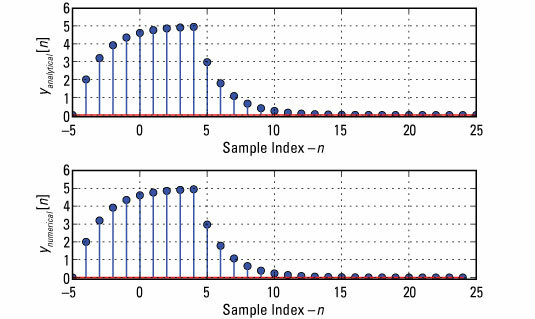 The support interval for the output follows the rule given for the continuous-time domain. The output y[n] starts at the sum of the two input sequence starting points and ends at the sum of input sequence ending points. For the problem at hand this corresponds to y[n] starting at [0 + –1] = –1 and ending at [3 + 1] = 4. Looking at Figure b, you can see that as n increases from n < –1, first overlap occurs when n = –1. 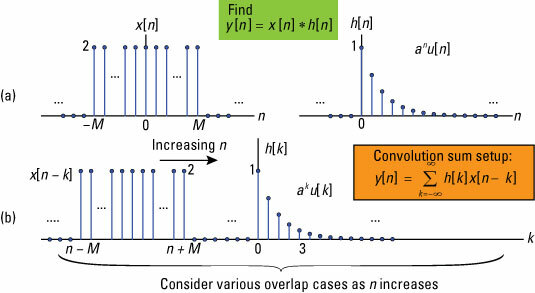 The last point of overlap occurs when n – 3 = 1 or n = 4. You can set up a spreadsheet table to evaluate the six sum-of-products related to the output support interval. To verify these hand (spreadsheet) calculation values, use Python functions in ssd.py to perform the convolution sum. The convolution sum function is y, ny = ssd.conv_sum(x1, nx1, x2, nx2, extent=(‘f’, ‘f’)). See the numerical results output sequence plotted. The results of the numerical calculation indeed correspond to the hand calculation. 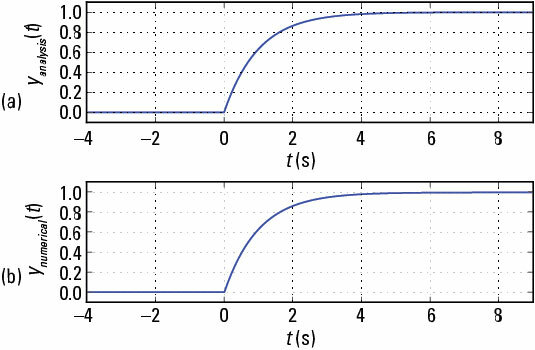 As a second example of working with the convolution consider a finite duration pulse sequence of 2M + 1 points convolved with the semi-infinite exponential sequence an u[n] (a real exponential decay starting from n = 0). A plot of the waveforms is given here. Case 1: From Figure b, you see that for n + M < 0 or n < –M no overlap occurs between the two sequences of the sum, so y[n] = 0. Use the fifth argument to the conv_sum() function to declare the extent of the second input sequence to right-sided (‘r’), as opposed to the default value of finite (‘f’). This setting ensures that the function doesn’t return invalid results. Here, you see that the piecewise analytical solution compares favorably to the direct convolution sum numerical calculation.